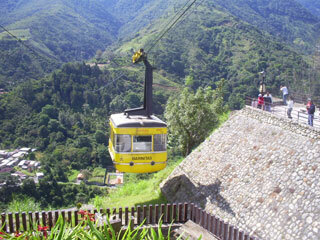 The Mérida Cable Car is a cable car system in Venezuela with base is located in the Venezuelan city of Mérida at an altitude of 1,640 metres (5,380 ft), and its terminus is on Pico Espejo, at 4,765 metres (15,633 ft). It is the highest and second longest cable car in the world for just 500 meters, but is in first place for being the only one which combined such height and length. Mérida Cable Car is a journey of 12.5 kilometers, reaching a height of 4,765 meters, making it an engineering marvel that is one of a kind and has over 40 years of history. This article uses material from the Wikipedia article "Mérida cable car", which is released under the Creative Commons Attribution-Share-Alike 3.0 License.